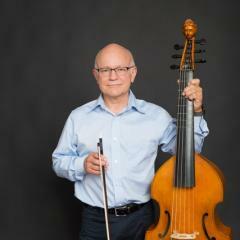 Jaap ter Linden, cellist, gambist and conductor, has a long history in the historical performance world. His many tours have taken him throughout Europe, Japan, Australia, and the United States. As conductor, he has worked with ensembles such as the Handel and Haydn Society, Philharmonia, Portland, and Lyra Baroque; Arion and Tafelmusik; the Wroclaw Symfonie in Poland; Bordeaux Opera in France, and many others performing repertoire from the 18th and 19th centuries, from Purcell to Mendelssohn and Schubert.